From time to time, I need to read a sweet story. 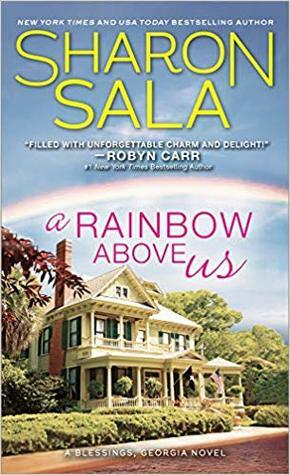 Sharon Sala’s Blessing series is all about heart and romance during adversity in a small town in Georgia. If you’re looking for extreme angst this is not for you. You won't find twists or unbelievable shocks either. Just a straightforward romance. Most of the stories have insta-love in them which I’m not a fan at all but for some reason, it’s perfectly acceptable in this series. The book tells the story of Bowie James who comes back to town to help rebuild his grandmother and aunt's home after it was damaged by Hurricane Fanny. Currently, they're living at the nursing home. Pearl and Ella have created a bond with a young woman, Rowan Harper. Harper lost her home and her father during the Hurricane. She's thankful for Pearl and Ella's friendship and their offer of shelter. Bowie lost his mother when he was eighteen. He loves his aunt and grandmother and when his aunt calls him, he knows he can't leave them stranded. Bowie builds homes for a living and helping with their home renovation is the least he could do for them. But coming back to Blessings will mean bringing back the longtime feud between his family and the Boones. The feud began three generations ago. It became worse when Randall Boone raped Bowie's mother when she was sixteen. Then when Bowie was a young man, Randall, and his brothers beat him up and told his mother and him to leave town or worse. Ten years later, Bowie is only back to help his grandmother and aunt. Yet, on his first night back, Randall’s brothers, Melvin and Emmitt, try to attack him but Bowie defends himself. The next morning, his car is keyed by Emmitt's son, Emmitt Lee Jr. The cops are called in and they take the kid away. Bowie wants to be left alone but the Boones don’t seem to want to let him be. Putting aside the last twelve hours, Bowie is happy to start rebuilding. Bowie is ready to pick up “ his girls” (Pearl and Ella) but he wasn’t counting on meeting Rowan. His aunt and grandmother had offered Rowan a place with them when their house becomes livable again. As the days' progress, Bowie realizes Rowan's a beautiful woman inside and out and he’s lucky she has helped his family and happy she's in his life. In a small town, nothing it's kept quiet for too long. Secrets and bad deeds have a way of surfacing. The town soon realizes the unfairness that had been bestowed upon Bowie and his mother. I enjoyed A Rainbow Above Us. It was fast-paced, romantic and had plenty of small-town charm. The town of Blessings is a character on its own. Most of its people are good people. They rise to the occasion and lend a helping hand.